If I’m gonna go through all that trouble getting my bike registered, the least I can do is get some blog fodder out of it. Besides which online information, while helpful, was often scattered about across different forums and sites. I could’t find any guides or walkthroughs of the process, so I may as well pay it forward and put one together. My first piece of advice about buying and registering a new bike in the Philippines is not to do it. Just buy a used or repossessed bike that already has its OR/CR and live your life. But if you’re determined to buy a new bike (as I was), then settle in for either a long wait (if the dealer handles your paperwork) or an uphill battle (if you do it yourself). One guy waited 11 months for his. If you let the dealer process the registration, the wait is 4–6 months on average. This is the status quo. Dealers send paperwork to the LTO (Land Transportation Office) in batches and it takes a while to get them back. If you’re just planning on riding around town and not going on any long trips, this should be fine. If, however, you wanna take it on major highways (which often have motorcycle checkpoints) or on ferries (which ask for the OR/CR as proof you didn’t steal the bike), you’ll be better off with your paperwork in order. And if you don’t want to wait half a year, you’ll have to do it yourself. This is the uphill battle. Expect resistance every step of the way, because “that’s not how it’s done.” Maybe not, but it’s still your right and no one can legally stop you. Remember that; keep it as your mantra. Buy the bike in full, in cash—it’s the only real way to have any negotiating leverage here. If you don’t have the money and need to get a loan, do it from an outside source, not the dealership. Manufacturers list the Suggested Retail Prices for their bikes on their websites. Look it up before you head in because it’s a guarantee the dealership’s sticker price will be above the SRP. After the dealer agrees to a price, tell them you intend on filing the registration yourself and ask if that will be a problem. They’ll likely try to convince you to let them handle it; hold your ground and insist it’s a deal-breaker. They’ll concede rather than lose the sale. Once the dealer agrees to let you handle it yourself, ask them how long it’ll take for them to prepare the necessary papers (for reference, my papers were ready two days after I requested / demanded them). Once you have them, make two copies immediately. Call your local LTO branch first to make sure they can handle new registrations. Not all branches do, and they’re far enough apart that you don’t want to have to shuttle from one to another if you can help it. 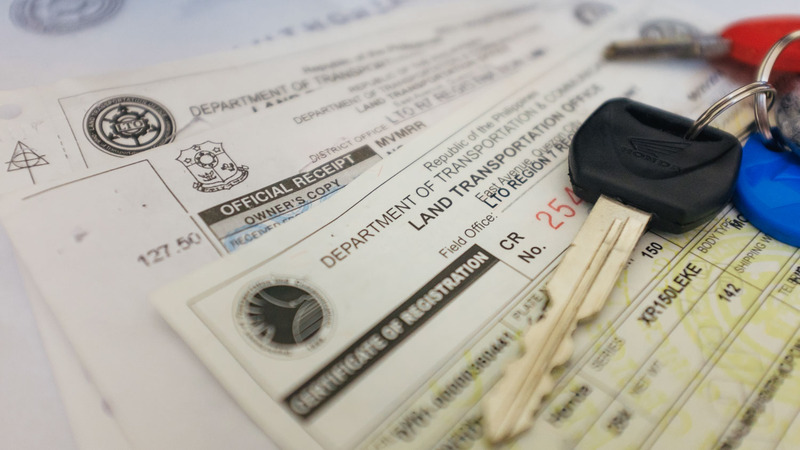 Be clear that you want to register a new vehicle; people almost never file their own initial registration and LTO agents will often assume you mean to renew your registration and respond accordingly. Once at the LTO, ask for new (again, specify lest you want to chase down a bunch of dead ends) registrations and bring over your paperwork. You’ll meet more resistance and people might grumble at having to do more work, but so long as your papers are in order they can’t turn you away. Put on your winningest smile, hand over the paperwork, and go home to wait. It took the Cebu LTO four days to process my papers. Some have supposedly gotten it done in a day. Either way, it’s in God’s hands now, so just sit back, wait, and start planning your road trip. The four days to process papers means what? How long till you had cr/or and plates? I’m about to buy my own first bike, and thanks for this. btw I live about 3 to 4 kilometers from work (Ayala), if I am to let the dealer handle the registration will I be able to use it from house to work in that short of a distance? Yeah — if you follow the standard registration procedure, you’ll be provided with the paperwork necessary to use your bike in the meantime. The only real limitation is that you might not be able to get it onto a ferry (which likely won’t be an issue for you). What happens if the dealer would handle the registration process? The LTO is supposedly improving so I don’t know if it’s still the same, but back when I was getting this done, if the dealer handled the registration it took months (some people had been waiting a year) for you to get your final OR/CR. But even though you don’t have your OR/CR yet, you can still ride your bike. Since you’re allowed to ride your bike without an OR/CR within the first week of buying your bike, the dealer will just give you a stack of backdated receipts to show to traffic cops. This is how everyone does it, and the system pretty much “works” as it is. As long as you don’t need your OR/CR for anything (like riding a ferry), you should be okay letting the dealer handle registration. Hi, among all the required paperworks you have listed, which ones should be provided by the dealer? Do you have to process the PNP Clearance , TPL and stencils yourself? The PNP clearance and stencils were provided by the dealer. I can’t remember who sorted out the TPL but I do remember that I didn’t have to go shopping around for it. So if I did have to take care of TPL, it was just a formality that I paid for at (or near) the LTO. Sorry — it’s been a few years and my memory’s fuzzy!